Kris Vincent the promising talent from Plymouth put down a marker for others to aspire to. Not only did he win the first West of England Gold Waistcoat Tour event of season against reigning champion Mike King (Exeter), he also marked it with a superb 107 century break against Ashley Wyer (Stroud) in the semi-final. Setting the pace in the group stages and fresh from his England Home Internationals debut Andy Symons-Rowe (Tavistock) continued with his good form finishing top of his group. He did this in swash buckling style against credible opponents, fellow England Internationals King, Vincent and 15 years old new comer Jack Smith from Top Breaks Snooker Club, Stroud, hosts of this first event. Symons-Rowe contributions included breaks of 66, 56, 50, 53, 52, 46, 42 & 43 demonstrating why he is a strong contender for the overall tour title. King having breaks of 65, 44 & 42 finished second in the group, verifying he does not intend to relinquish the title without a fight. 18 year old Ben Pike (Honiton) continued to improve by qualifying for the knock-out stages posting breaks of 83, 45, 57, 48, 46 & 41 and is on course to be a thorn in the side of more senior players in future events. Other performances of note came from 16 years old Darren Bond (Tiverton) making a break of 68. Wayne Branton (Plymouth) despite making breaks of 85, 80 clearance and a 57, had an inconsistent day, only mustering two wins. Neil Chiswell (Plymouth), a member of the current English Amateur Snooker and Billiards Team Champions, found the competition in his group too Strong on the day, but will no doubt come good in later events. Sam Baird (Halberton) with breaks of 57, 51, 56, 56,44 & 40 surprised everyone by coming top of his group, out-ranking England International Andy Radford (Exeter) and local hot shot Ashley Wyer (Stroud). Radford although lacking match practice proved ever consistent finishing second making breaks of 80, 60 & 45. Wyer, new to the tournament, showed he has what it takes to do well in this company. Reigning (WEBSF) Junior Silver Waistcoat Champion 17 years old Grant Cole (Plymouth) played solid snooker, making a string of modest breaks and narrowly missed out on qualification. In the knock out stages in-form Symons-Rowe came up against local player Wyer. In the first frame Symons-Rowe made a break of 65 only to see Wyer draw level in the second. With the match finely poised and Symons-Rowe 61 points in front the final frame it looked all over. However, Symons-Rowe made a mistake and could only sit back and watch Wyer ‘make’ a off-set plant to commence a well crafted 36 break followed by a very good safety shot on the last red. This proved to be the deciding factor of the match as Symons-Rowe failed to get safe. Wyer then clinically took the frame and match with break of 33 clearance to win on the black ball. Vincent over-came Radford 2-1 in a tightly contested and tactical match. Vincent showing the maturity of a player beyond his years against one of the best tacticians in the tournament. Potting machine King with breaks of 72 & 68 swept aside Darran Lock (Seaton) and in-form Baird beat Pike 2-0 with a break of 49. The first of the Semi finals saw Vincent, proving yet again why he is becoming one of the strongest forces on the (WEBSF) Gold Waistcoat Tour. After losing the first frame to Wyer (53 breaks) he provided on lookers with a superb 107 break to level the match. Vincent followed this by dominating the final frame finishing with a 48 break to reach the final. In the other semi final King overcame Baird 2-0 with a break of 85. Baird can take much consultation that he has now proved himself a worthy opponent at this level and can look forward to the next event. The final saw King and Vincent, two titans, contest a match which lived up to the high standard set during the day by both players. Although there were no big breaks to speak of the match contained several breaks of 30+ and good safety play from both players. Vincent won the first game on the colours and the second after King conceded on the blue to capture the first West of England Gold Tour Snooker event of the season. A website where all the latest Snooker and Billiards news can be viewed from around the region, including links to national and other sites. To become a member of the WEBSF and take part in the tours go to http://www.websfsnooker.com where you can download a application form. Alternatively contact Roger Cole. The West of England Billiards & Snooker Foundation came to Riley’s Snooker Club, Exeter to stage event 2 of the highly successful Gold Waistcoat Tour, sponsored by the Sunday Independent. Although short of match practice Andy Radford quietly progressed through the early rounds of the tournament with an air of consummate professionalism. He used the time between matches wisely on the practice table. This proved decisive in preparing himself for the next match, and one his fellow players could do well to emulate. By the time he reached the final he was fully focused and deadly amongst the balls, looking every bit the winner. Radford was to meet fellow England International and current Gold Waistcoat title holder Mike King in the final, a mouth watering prospect to end a superb days play. Both players were well supported and the crowd were treated to a real exhibition of snooker. Radford took the early advantage in the first frame, forcing king to commit a foul which left Radford an opening to compile an impressive frame winning break of 75. He followed this with a 52 in the second to storm into a 2-0 lead. King was looking dead and buried in the third frame of this best of five. He was forty odd points behind when Radford gave him a glimmer of hope with half a chance. King, who often performs his best snooker under pressure, seized the opportunity with determination and aggression pulling out a tremendous clearance of 56 to seal the frame and stay in the match. Radford, was not phased by this, rose to the challenge and roared to victory with a magnificent break of 85 to clinch the frame and match. The semi-final stages were comfortably won by the Rileys pair from Exeter, King and Radford both winning 2-0. King dispensed of Wayne Branton, Plymouth with relative ease with good solid matchplay snooker. Radfords experience showed in his encounter with Darran Lock, Seaton. Lock was undone by the potting prowess of Radford. The match of the quarter finals was between Radford and the up and coming star from Honiton, Ben Pike. Pike hit Radford with a beautifully crafted break of 50. Radford responded with a magnificent clearance of 63 to steal the frame. In the next frame Radford fluked the pink after potting his first red and went on to compile a frame and match winning break of 77. The second quarter final matched two contrasting styles of play in Darren Bond, Tiverton and Lock. This match proved to be a tense affair with all three frames going the distance. Lock took a scrappy first frame on the black. Bond recorded a 41 break in the second frame, only to watch as Lock pegged it back to a respotted black. Bond won the toss and elected to put Lock in first. Lock saw his chance to clinch a dramatic victory and attempted to cut the black of it’s spot only to watch the cue ball drop in to the yellow pocket and lose the frame. The deciding frame was another nervous affair with both players making elementary mistakes. After both players twitched on the black Lock slammed in a ten foot pot to claim a 2-1 victory. The third quarter final pairing was between King and Gold Waistcoat debutante Kevin Holloway from Plymouth. Holloway was not overawed by the strong field and produced some quality snooker holding his own. King eventually ran out the winner 2-1 helped with a break of 41 along the way. The remaining quarter final was between Branton and Steve Downing, Redtruth. Both players failed to produce the quality of snooker that helped them through the group stages. It was Downings knowledge of billiards that was the telling point in tying up Branton to win the safety exchanges but he couldn’t convert these chances into points thus allowing Branton to run out a 2-1 winner. In group A eighteen years old Pike continued to demonstrate a high level of consistency in his potting and safety play finishing top of this group with a solid run of breaks. Pike was in good company with top Cornwall County player Downing finishing second. Other group members included England International Kris Vincent, Plymouth and a member of the English Team Champions, Neil Chiswell, Plymouth. The best break of the day came in group B, a superb 107 from King who finished top of the group with further breaks of 68, 62, 49 and a string of 30’s. The consistent Lock having stepped up from the Silver Waistcoat was not overalled by the standard finishing second in the group. Greg Batten, Tiverton posted several breaks in the 30’s and 40’s but still failed to realise his potential. Jack Smith had a long trip from Stroud that proved fruitless this time. However, competition of this standard is sure to improve his already good game. Branton returned to form by finishing top of group C overcoming two England Internationals, Andy Symons-Rowe who had breaks of 84, 64 & 43 and Radford who, with his usual composure, finished second in the group recording breaks of 73 & 69. Sam Baird, Tiverton after a good performance in the last round, failed to find consistency with his break building this time, only posting a 69. Prior to the commencement of the tournament Darren Bond received a special award from the Devon County Billiards & Snooker Association in recognition for his extraordinary achievement of winning five consecutive U16 titles, a feat that is unlikely to be repeated, if ever! Bond not overalled by this accolade went on to win his group. New comer to the competition Kevin Holloway, Plymouth finished second in the group losing out only to the group winner Bond. 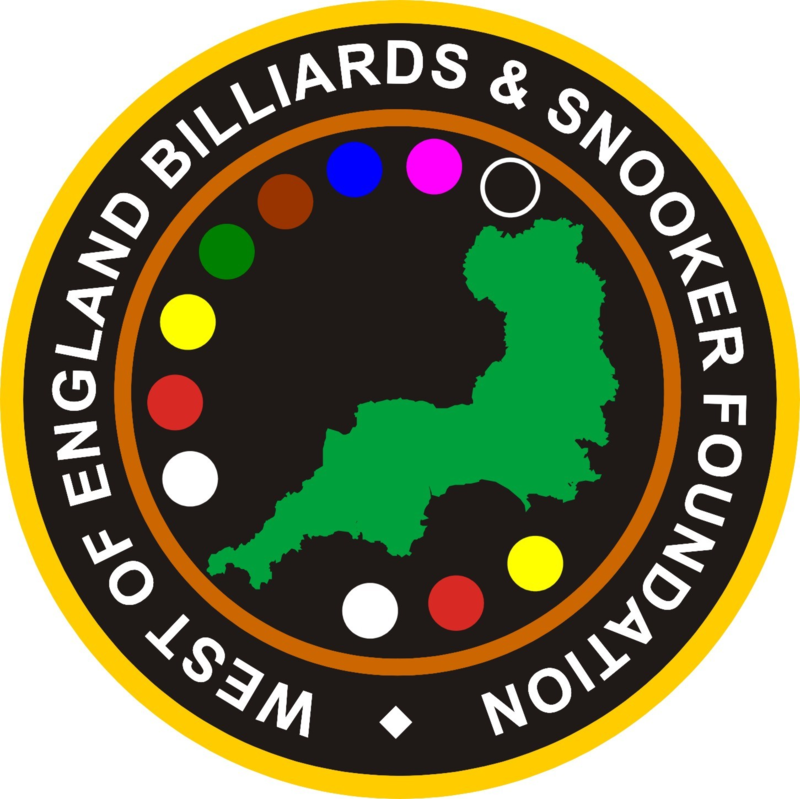 Further information regarding the West of England Billiards & Snooker Foundation can be found on the WEBSF website http://www.websf.co.uk where all the latest Snooker and Billiards news can be viewed from around the region, including links to national and other sites. To become a member of the WEBSF and take part in the tours go to http://www.websfsnooker.com where you can download a application form. Alternatively contact Roger Cole. The West of England Billiards & Snooker Foundation Gold Waistcoat Tour arrived at Rileys Pool and Snooker Club in Plymouth, Devon. Despite the adverse weather, a quality field battled the elements to take part in the third event of this ever-popular series, producing the highest standard of snooker to date. A new record of three centuries was achieved on the day. Not only did the top England internationals provide great quality snooker so too did the youngsters. The youngsters are realising the standard they need to play to compete on the Gold Tour. They are reaching the dizzy heights of their peers at great speed and are pushing the standard through the roof. This has been highlighted by the WEBSF members impact and success in the National game. The Gold Waistcoat Tournament provided three magnificent century breaks followed up with numerous breaks ranging between 60 and 90’s. This level of snooker surpassed all expectations with some of the credit going to Rileys for the hard work in providing an excellent venue with superb playing conditions. Andy Radford kept one hand on the Sunday Independent sponsored trophy by winning this latest Gold Waistcoat Tournament. Radford followed up his success of last month’s event to stay top of the ranking table and the first player to achieve back-to-back tournament wins. In the final Radford defeated the ‘in form’ player from Tiverton, Greg Batten, 3-2. In a highly tense final, Radford opened with a break of 36, only to watch Batten reply with a 32. This break was enough to allow Batten back into the frame but Radford stole the frame 71-42. Radford quickly went into a 2-0 lead winning 59-23. Third frame Batten stepped up a gear to rattle in a break of 56 to climb back into the match 80-22. The fourth frame followed suit with Batten making a 47 break to level the match. With the match set for a big finale, Batten had the first chance taking a 30 point lead. Batten then potted a storming red only to miss the colour allowing Radford to seize his chance and make a punishing 57 break to take the coveted title 3-2. The highest break of the day went to the Tiverton hotshot Batten, recording a magnificent 116 break under pressure against the reigning Gold Waistcoat champion from Exeter, Mike King. The match was poised all level going into the deciding frame of the semi-final when Batten stormed in with this beautifully crafted break. In the other semi-final, Radford dismissed Neil Chiswell of Plymouth with relative ease 2-0. The quarter-final line up threw together the eventual winner Radford against the all-rounder of Plymouth, Mike Day. Radford recorded a trio of breaks 61, 44 and 41 to run out a 2-1 winner. The second quarter-final had King against the debutant from Glastonbury, Jamie Dyke. Dyke who had a good day, couldn’t halt the march of King who made a match winning break of 65 to claim victory 2-0. There was added purpose to the third quarter-final pairing as they were due to meet 2 days later in a major event at Pontins Holiday Camp, Prestatyn. Tension played a big part in this encounter, and the match went to a deciding frame where Batten held his nerve to run out the winner 2-1. The last quarter-final had the newly England International Chiswell against the youngster from Honiton Ben Pike. Chiswell potted solidly combined with good match play snooker to ease into the semi-finals 2-0. England International Kris Vincent from Plymouth and English Southern Amateur Champion, Andy Symons-Rowe from Tavistock, recorded the other two centuries on the day. Both exceptional breaks were made against the young Tiverton whiz kid Darren Bond. The first being a 100 by Symons-Rowe and the next a 109 by Vincent both secured in their Group A fixtures. Group A brought together three of the pre-tournament favourites in the former England International and current Gold Waistcoat Tour leader, Radford and current England Internationals Symons-Rowe and Vincent. Amazingly Radford won this group without loosing a match making a handful of breaks over 60 with the highlight being 96 and 78 in his 2-1 victory over Symons-Rowe. This threw the group wide open for the other competitors. Vincent finished runner up by virtue of a frame leaving Symons-Rowe in disbelief. Wayne Woodger of Exeter and Darren Bond, Tiverton, played well with both players making several contributions of 40 plus. Group B was won by England international King who set the tone in the first fixture against Chiswell. The first two frames were equal with both players recording breaks of 48. King took victory 2-1 with the match winning break of 80. These two players progressed through to the knockout stages. Grant Cole and Kevin Holloway, both from Plymouth, recorded breaks of 79, 50 and 48 respectfully. The winner of Group C was the Tiverton based player Batten who produced a 69 break in his 2-0 win over Day. Day had earlier mastered a 94, breaking down missing a relatively easy pot to reach the century. Day also recorded a 59. Sam Baird enjoyed a 2-0 victory over Batten who hit a 35 break only to watch Baird reply with a 39 to steal the frame. Baird took the match with a fine 42 in the next frame. In what was the tightest group of all, Group D where every match went the distance, Ben Pike from Honiton came out on top with breaks of 52 and 30 in his 2-1 victory over Darren Lock from Seaton. Pike also made a 45 break in his match against another debutant, Graham Ward from Exmouth. Runner up in the group was Jamie Dyke from Glastonbury. Andy Radford (Exeter) has set a benchmark for others to aspire to in claiming a third consecutive event win in the Sunday Independent sponsored, West of England Billiards & Snooker Foundation Gold Waistcoat Tour. In the two previous Gold Waistcoat events and throughout this one Radford demonstrated a level of matchplay befitting that of a former Professional and England International. The round-robin stages saw Radford win group A comfortably without dropping a frame making three 50 plus breaks for good measure. Luke Walker (Plymouth) who has recently moved into the region never quite found the form he is capable of in this his first Gold Waistcoat event. A recent 141 break in the local Plymouth league suggests he is one to look out for in future events. Mike Day (Plymouth) took second place in the group over Adrian Bond (Tiverton) on count back and Jamie Dykes (Glastonbury) did well to take frames off of Luke Walker and Mike Day. Group B proved the toughest group to qualify from as several matches went the distance. Steve Downing (Redruth) started his campaign with a 2-1 defeat at the hands of the laid back, almost nonchalant youngster Darren Bond (Tiverton). Downing followed this with three good wins to win the group. Gregg Batten (Tiverton) also started strong with wins over the talented Silver Waistcoat players Grant Cole 2-0 and Darren Bond 2(69)-1(53). However, Batten lost to Kevin Holloway (Plymouth) 2(43)-1 and Downing 2-0 which coast him dear, failing to qualify on count back. The best frame of the group must go to Cole, who in his match against Kevin Holloway (Plymouth) posted two 52 breaks, the second a clearance in the same frame. Bond joined Downing as the second group qualifier. Group C proved uneventful compared to the other groups with England International Kris Vincent won his matches with the loss of just one frame. In Vincent’s first match Ben Pike (Honiton) matched him in an excellent bought of safety play which Pike capped with a well crafted 41 break. However, in spite of looking in control Pike’s inexperience showed as Vincent cashed in on his mistakes running out a comfortable 2-0 winner. Neil Chiswell (Plymouth) was the only player to take a frame off of Vincent and as a result qualified second. Chiswell also posted the only break of note, a 53 in his 2-0 win over Darran Lock (Seaton). The final group saw England International and reigning WEBSF Gold Waistcoat Tour Champion Mike King (Exeter) hardly break into a sweat winning all his matches. King capped this performance with the only century break of the day, a fine 105 in his 2-0 win over Wayne Branton (Plymouth). Both Wayne Woodger (Exeter) and Branton (Plymouth) had bad days at the office but will know doubt come good in future events. Sam Baird (Halberton) fresh from a WEBSF Silver Waistcoat victory joined King in qualifying for the KO stages posting a couple of useful 40 plus breaks for good measure. Match of the quarters was King versus Bond. Bond never phased by the thought of playing someone of King’s calibre did well to take this first quarter final all the way. King won the first with a 69 break, Bond reply with a 45 to take the second before King stamped his authority taking the match winner with the aid of a 54 break. The other Quarter finals proved less eventful with Radford beating Chiswell, Downing beating Baird and Vincent beating Day all by the same score of 2-0. In the semi finals Radford took on Downing and won 2-1 despite a fine 69 break from Downing in the second frame and King rattled in breaks of 54 and 45 in a 2-0 win over Vincent. The final was reduced to the best of three due to both players having to play matches later that evening. This was the second time this season these two fine players, of differing styles have met in Gold Waistcoat finals. Unfortunately for King the outcome was to be the same with Radford running out the winner. However, the match was close enough to have gone either way and provided onlookers with thoughts of what might have been. After Radford took the first frame with a modest 39 break King started the second with 11 reds and 10 blacks (81) before missing the eleventh black whilst going for the maximum (147). Both players have made a number of maximums in practice and are always worth watching, just in case! However it was Radford quickly back to business with a match winning 77 break in the final frame. Both players expressed mutual respect for one another during the final with Radford willing King on to a possible 147 once the frame was lost and King showing appreciation for Radford’s match winning 77. Gold Waistcoat Tour at the Bells Court Snooker Club, Falmouth. Batten, so often the nearly man, finally shook off this label with a consistent display of dominant snooker that concluded with a resounding 3-0 win over reigning champion Mike King in the final. With both finalists part of the Exeter Rileys team that are competing in the English Amateur National Team Championship final later this year, the final looked like going the distance. In the 1st frame, Batten had the better run of play, compiling the first frame winning break to go one in front. Batten continued this form in the second, building up a 40 lead with 51 points left on the table. He then potted on a long red as a ‘shot to nothing’ leaving the cue ball safely in baulk, with an easy opportunity to snooker King. However, Batten failed the simple roll-up behind the yellow leaving it short handing King the initiative. King, snookered after a foul, exercised his right to have Batten play again. Batten failed to escape, resulting in the white being replaced. Batten hit the red at the third attempt gifting King a golden chance to clear the table and level the match. However, King made just 30 from the leave only to run out of position on the pink, allowing Batten in to extend his lead to 2-0. King rueing missed chances never really found his form in the third frame, allowing Batten to run out a 3-0 winner, securing his first win on the tour. In the semi-finals King halted the charge of fellow International and team mate Andy Radford producing a stunning burst of break building. Radford, who has set the standard this season by winning a record three in-a-row Gold Waistcoat tournaments was for once found wanting, as King fired in breaks of 61 and 54 to progress through to the final 2-0. In the other semi final Batten disposed the Tavistock ‘Tornado’ Andy Symons-Rowe with relative ease 2-0. The quarter-finals produced an unprecedented array of breaks. The first match saw Batten crush the up-and-coming youngster Darren Bond also from Tiverton 2-0. Batten produced the highest break of the day in this match, a magnificent break of 93 in the second frame missing the black with one red left. This followed on from a break of 85 in the first frame. In the second match Symons-Rowe just squeezed past another promising youngster Bobby Southworth (Falmouth). Symons-Rowe held his nerve making breaks of 51 and 48 to run out a 2-1 winner. The third quarter final saw Redruth’s star Steve Downing take the first frame against King after which Downing could only stand and watch as King rattled in breaks of 64 and 58 to clinch a 2-1 victory. Radford took on Darren Lock from Seaton in the fourth qualifying match. Radford won the first frame only to watch Lock pull one back to level the match. Radford then found a second gear compiling a break of 58 in the deciding frame to progress to the semi-final stage. In group A the super quick potter Jamie Read from Redruth was on the receiving end of some tasty break building. Luke Walker (Plymouth) made a 55 break, Batten an 82, Radford 75 & 40 breaks and Grant Cole (Plymouth) breaks of 84 & 41. All defeated Read by two frames to nil. Batten out-classed class act Radford wining 2-0 with breaks of 64 & 44. Cole continued his good run with a notable 2-1 win over Walker posting breaks of 43 & 38 only for Batten to remind him how tough it is in this company with a 2(44,41)-0(40) win. Batten and Radford qualified from this group. Symons-Rowe and King qualified from group B. Symons-Rowe made a quick fire 71 in a 2-0 win over Rob Charman (Redruth). Adrian Bond (Tiverton) produced a mini upset beating King 2-0 with the aid of a 46 break. King determined to make amends beat Symons-Rowe 2-0 with 49 and 45 breaks. Symons-Rowe made it one win apiece defeating Bond 2-0 with a 57 break. Bond held it together making a well crafted 51 break to record a 2-1 win over Charman. In group D and playing from his home venue Bobby Southworth beat fellow Cornishman Phil Lane 2-1 he followed this with a 2(56)-1(50) win over Sam Baird (Halberton) and a 2(56)-0 defeat of Ben Pike (Honiton). Downing halted the Southworth rout beating him 2-1 making a 44 break in the process. Downing went on the beat Lane 2-1 despite a super 86 break from Lane. Baird kept the group positions tight with a 2(58)-1 over Downing. The penultimate West of England Billiards & Snooker Foundation Gold Waistcoat Tournament, sponsored by the Sunday Independent sailed into Plymouth bringing with it quality snooker from the best players in the region. This tournament, ever increasing in popularity, was held at the Victoria Snooker Centre, St. Budeaux. Sam Baird, Silver Waistcoat star from Tiverton turned silver into gold by winning this the 6th Gold Waistcoat event. In an electrifying final Baird defeated fellow Tiverton team mate and winner of the previous event, Gregg Batten 3-1. Batten who had played like a professional all day, looked like making it two in a row after compiling breaks of 53 and a 35 clearance to seal the first frame. However, Baird had not read the same script halting Batten’s charge by holding his nerve to steal the second frame and level the match 1-1. Batten after playing class snooker all day seemed to burn-out when facing the final hurdle, could only watch as Baird kicked off in frame three with a breath-taking break of 61 to take a 2-1 lead. Baird then followed this with a 40 break in the fourth frame to leave Batten requiring snookers. After several attempts at trying to snooker Baird, Batten finally conceded the frame and match 3-1. WEBSF Head Coach was heard to comment “Today we have witnessed Sam ‘turn the corner If he continues to play with this level of purpose and maturity the future augers well for him”. Two players shared the title of ‘breakmaster’ both posting magnificent breaks of 115. The first century coming from England International Mike King from Rileys Club, Exeter. King after trailing 0-1 to Ben Pike from Honiton in the group stages drew level with breaks of 46 and 34. He then moved up a gear, taking the match 2-1 aided with a superb 115 break. The second 115 break of the day was posted by Batten, still in good form after his previous Gold Waistcoat victory in the last round he looked favourite for a repeat performance. After wining his group in style he saved his best for the quarter and semi finals with an emphatic brace of centuries. The first was a phenomenal break of 115 against fellow Tiverton player Adrian Bond in the deciding frame of their quarter final match. Batten followed this with a superb 97 and 108 in the semi-final, knocking the stuffing out of England International Andy Symons-Rowe from Tavistock, who could only watch as Batten dominated the match to progress to the final. This came as a shock to Symons-Rowe who must have felt confident after beating fellow England International Neil Chiswell 2-0 with the help of a 95 break. In the other half of the draw Radford continues to be a thorn in the side of fellow Exeter team mate Wayne Woodger. Radford ran out a comfortable 2-0 winner. In the last quarter final Baird dismissed another England International Kris Vincent 2-1 with a fine display of potting posting breaks of 78 and 40. In the second semi final Baird was faced with the master-of-matchplay and England International Andy Radford. Baird however, was not to be phased by this task, dispersed Radford with relative ease 2-1 to reach the final. In group A Batten won all his matches to head the group, he made breaks of 80 and 63 in defeating Grant Cole (Plymouth) 2-1. Cole, after going 1-0 down to Woodger, hit back with a 54 break to claim a well earned 2-1 win. Jamie Denham from Exeter made a 47 break in a 2-0 victory over Mike Day (Plymouth), Day recovered some credibility by recording breaks of 43 and 41 against Cole and Woodger respectively. Woodger placed second joined Batten in qualifying for the final stages. Vincent won group B on frame difference over fellow England team mate Chiswell. Along the way Vincent recorded a break of 74 in his 2-0 victory over Wayne Branton (Plymouth) and a break of 67 against current Gold Waistcoat champion King. This frame proved crucial in knocking King out of the final stages of the tournament, the first time in 10 events! Chiswell rallied a 55 break in a 2-0 win over King to qualify in second place. Branton recorded a 64 break in a 2-0 victory against Pike. Radford, who is top of the ranking table won group C. Radford watched as Adrian Bond kicked off with breaks of 64 and 53 only for Radford to recover in champion fashion, recording a frame and match winning break of 84 to win 2-1. Adrian Bond’s younger brother Darren was also on the receiving end of Radford’s break building prowess, Radford posting a well crafted break of 78 in a 2-0 win. Bond was to follow this defeat by holding his nerve to knock in a flashy 78 break in a 2-1 good win over Luke Walker (Plymouth). The first match in group D saw Baird not waste any time setting out his intentions for the day against debutante Ian Barlow, playing on ‘home turf’. Baird pounced with two superb clearances of 96 and 65 to win emphatically 2-0. Baird finished runner up in the group recording other breaks of 48 and 49. Symons-Rowe won the group producing a hat full of breaks, the highlight being a 64 break in his 2-1 victory over Baird. Barlow recovered from his demolition by Baird to construct a solid break of 66 against Symons-Rowe only to watch Symons-Rowe clear the table with a break of 43 to pinch the frame by a single point and win the match 2-0. Darren lock (Seaton) failed to qualify but slotted in a couple of 50 breaks for good measure. Guest of honour for the day was Reg Hayes of WEBSF’s ‘twin’ foundation the newly formed South East Billiards & Snooker Foundation. After Hayes presented the prizes he commented on how professional the tournament had been run and how sporting the players had been in both victory and defeat. Hayes went on to comment on the high quality of snooker that he had seen throughout the day and that the players from his region would have to be on the top of their game if they stood any chance of beating the WEBSF team in the ‘Foundations Cup which is to be held later in the year in September in Woking Snooker Club. After the final event of the season Andy Radford from Exeter finished top of the rankings with 3490 points and is therefore crowned West of England Billiards & Snooker Foundation, Gold Waistcoat Tour Champion 2006. During his campaign Radford saw off challenges from a quality field of players that boasts some of the best players in the region. Reigning champion and former England International Mike King (Exeter) finished second with 3030 points ahead of Greg Batten (Tiverton) who pipped England International Kris Vincent from Plymouth by just 50 points, 2550 to 2500. These four players put themselves in the frame to be invited to play in a challenge match against the best from the South East Billiards & Snooker Foundation for the ‘Foundation’ Cup in September of this year. A double victory by winning the final tour event, which was held in Riley’s Exeter, was to elude Radford as the talented youngster from Plymouth, Kris Vincent was to win this event. Vincent overcame the in-form Greg Batten (Tiverton) in the final to post his second Gold Waistcoat Tour event win of the season. It was a close call leading up to the final for Vincent, he only just managed to qualify from his group in forth place at the expense of highly rated Wayne Woodger, Exeter. As often is the case with players just qualifying, Vincent saved his best for the knock-out stages. Against in-form Wayne Branton, Plymouth in the quarter-final he made a fine break of 77 to run out a 2-1 winner. He then repeated this score line against another very talented youngster, Darren Bond form Tiverton in the semi-final. In the other half of the draw Grant Cole, Plymouth met Radford in the quarter final with Cole, having already posted some of is best results to date in the group stages with a fine 2-0 win over Batten, he was in no mood to be up-staged by Radford beating him 2-1 in a very tight encounter. Batten was to avenge his earlier group stage defeat against Cole in the semi-final with a 2-0 win, both frames being very close. Batten posted breaks of 75 and 53 in a 2-0 win over the much fancied and current champion Mike King, Exeter. In the last quarter final Darren Bond, beat the prolific potter Sam Baird, Halberton by the same margin. The group matches produced very high standards of play, which has become the norm in these Gold Waistcoat events. No less than three century breaks were posted, the highest being 119 by Radford that secured him the overall title of the ‘Break Master’. Radford added breaks of 101, 63, 65, 56. Batten weighed in with breaks of 115, 93, 62, 58 and 56 and the much improved Baird made breaks of 77, 69, 57, 53, 44, 42 with the remaining field adding a further twenty breaks over 50. Radford finished top of group A with Baird, King and Vincent also qualifying. Adrian Bond, Tiverton and Neil Chiswell, Plymouth both failed to make the qualifying stages this time such was the high standard of play. Group B saw the consistent Wayne Branton, Plymouth come through to take top spot, followed by Batten, Darren Bond, and Vincent.